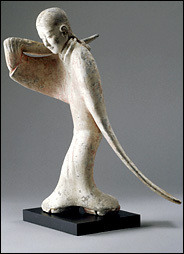 Han Dynasty dancer (a clay figurine). Her long sleeves are part of the dance, and also show that she doesn’t have to do any practical work. When Gaozu (who was also called Liu Pang) started the Han Dynasty in 202 BC, he didn’t really change that much from the system that Qin had set up. Gaozu still got the kings and their families to live at his capital city, and he still sent out governors and judges whom he could trust. But Gaozu didn’t kill or exile the scholars anymore. Instead, Gaozu called for smart educated men to work for him, to be the governors and judges he needed. He knew these smart guys would be good workers and make fair, wise, decisions (but still he would not let any women be judges, no matter how smart they were). About this time, some of these smart guys invented a new kind of plow made all of iron. It was lighter and sharper than wooden plows, and people could produce more food more easily with it. That made China richer. Gaozu did let some areas have their own rulers, if the rulers were really loyal to him. We call this earlier part of the Han Dynasty the Western Han, because Gaozu’s capital was in Western China, at Chang’an. Gaozu’s wife was the Empress Lu. When Gaozu died, Lu tried to take over power for herself, and she succeeded in controlling Chinese politics, even though it was very difficult for women to get political power at this time. Lu ruled for fifteen years as regent for her son, after frightening him into giving her power. Empress Lu was good at running the government and made friends with the other powerful people. Lu paid tribute to the Xiongnu every year. She sent many Han women to marry Xiongnu men in order to build connections with China’s northern neighbor. 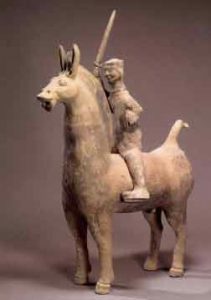 The Xiongnu were probably the same people that we call the Huns. Lu’s son died in 188 BC, and after that Lu ruled through her adopted grandsons. She died when she was 61 years old, in 180 BC. After Lu died, Emperor Wen took power after a coup killed most of Lu’s relatives. Wen was another son of her husband Gaozu, but he had a different mother. Wen presented himself as humble and quiet. He was a follower of Confucius, though his wife, Empress Dou, was a Taoist. Wen cut taxes and kept the peace. Wen died in 157 BC, and his son with Empress Dou, Emperor Jing, took over. So Jing was the grandson of the original Han emperor Gaozu. Empress Dou and her Taoism were still important under Emperor Jing. Like his father, Jing kept taxes low, and kept China at peace. Thanks to the peace, and increasing trade on the Silk Road, China became richer and richer. In 141 BC, Jing’s son Wu Ti became emperor. People called Wu Ti the Martial Emperor, because he led many campaigns against the Huns (the Xiongnu). At this time, the Huns were living north and west of China, and they tried to invade all the time. But just a little further south, the Sogdians were beginning to set up safe trade routes that connected Central Asia to China and West Asia – this made the Silk Road stronger and more important. China sold silk and tea west to Central Asia in exchange for horses and carpets. They bought some things from even further away: spices and medicines from the Mauryan Empire in India, glass and silver from the Parthian Empire, fur and gold from the Roman Empire, and even ivory from Africa. Practice Chinese calligraphy – painting with water! Wu Ti also set up the first university in China, in 124 BC. Young men (only men were allowed to go to university then) were chosen for being very smart and hard-working and then the government paid all their expenses while they went to the school. At first the university had only fifty students, but it grew quickly. Students at the school mainly studied Confucian philosophy, which Wu also made the official state philosophy. Now men who wanted to become governors and judges had to pass a very hard test to see if they were smart and well educated enough. In 111 BC, Wu Ti invaded northern Vietnam, and made it part of the Han empire. And in 108 BC, he invaded northern Korea and took it over. Wu Ti died in 87 BC. He had spent all the money that his father and grandfather had saved up for China. Cite this page: Carr, K.E. Han Dynasty China History – Western Han China. Quatr.us Study Guides, June 6, 2017. Web. April 21, 2019. Thanks, Kate! It’s very kind of you to write and let me know. Tell your teacher about this site, and maybe they can link to us and help other kids find it! Thanks, boi! If there’s anyone at your school who can link to us (librarian? teacher?) we would super appreciate that! You’re welcome! I’m glad we could help, Kai! Good for you both for working so hard! I’m sure he learned a lot. Thanks! 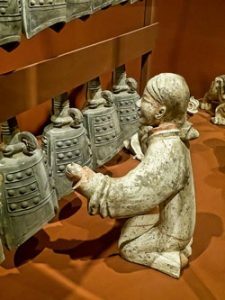 People mostly study ancient China in 7th grade, so we try to make this page useful for you!